Illustration of physical components surrounding and bridging protostars A and B in the IRAS 16293 system, and outflows emanating from IRAS 16293A. Credit: Van der Wiel et al., 2019. An international team of astronomers used the Atacama Large Millimeter/submillimeter Array (ALMA) to investigate gas dynamics in a nearby young protostellar binary known as IRAS 16293−2422. Results of the observations, presented in a paper published March 29, provide more insights into the evolutionary status of this system. Protostars as single objects or existing in binary systems are important for astronomers to study the mechanisms of star formation. In some protostellar binaries a peculiar "bridge" of material is clearly visible, which connects the recently formed components. This remnant material could be the key to better understand how stars form and evolve. IRAS 16293−2422 (or IRAS 16293 for short) exhibits such a bridge connection between the two companions. It is a young, Class 0 protostellar system located some 400 light years away in the Ophiuchus cloud complex, consisting of two protostars, designated IRAS 16293A and IRAS 16293B, separated by about 636 AU from each other. Besides an arc of dust and gas connecting the sources, previous observations of IRAS 16293 have also found outflows from the object "A." These features make it a very complex system, where the observed gas line emission can only be explained by a combination of multiple physical components. In order to gather more information about on this subject, which could provide essential hints into the nature and evolutionary status of IRAS 16293, a group of astronomers led by Matthijs H.D. van der Wiel of the Netherlands Institute for Radio Astronomy (ASTRON), has employed ALMA to observe this binary. The observations were conducted between June 2014 and May 2015, as part of the ALMA-PILS spectral imaging survey. From the data provided by the survey, the researchers chose molecular gas line transitions of CO, H2CO, HCN, CS, SiO, and C2H and used them to kinematics, density, and temperature in IRAS 16293. Analyzing the results, the astronomers found that the kinematically quiescent bridge of dust and gas spanning between IRAS 16293A and IRAS 16293B has a density within the range between 40,000 and 30 million cm-3, and is stable against radial collapse. The data suggest that this bridge is a remnant substructure of a filamentary circumbinary envelope that has undergone turbulent fragmentation to form both protostellar sources. Moreover, the observations uncovered the presence of a separate, straight filament seemingly connected to IRAS 16293B and seen only in C2H, with a flat kinematic signature. This structure stretches straight across source "B" at position angle of about 15 degrees. The researchers noted that the properties of this filament indicate that its origin in outflow activity of IRAS 16293B can be ruled out. Taking into account the results from ALMA observations and also from previous studies, the authors of the paper found that IRAS 16293B may be in an earlier evolutionary stage than the source "A." In general, they concluded that IRAS 16293 may represent a particular stage in the evolution of binaries, a phase which many other protostars may go through at one point in their evolution. 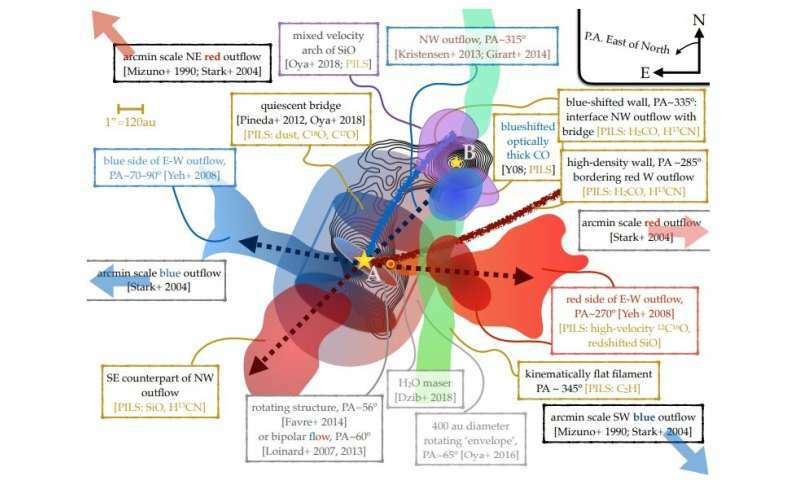 "The data suggest that this bridge is a remnant substructure of a filamentary circumbinary envelope that has undergone turbulent fragmentation to form both protostellar sources." Not unlike the turbulent fragmentation that would help in pebble formation of planets. That's a pretty detailed diagram. ALMA strikes another blow for truth, freedom, justice, and the scientific way. And not to forget that it is an integral part of the EHT! It is not written in the article, but this is just another one observation in long line of observations which shows that standard mainstream physics is clueless when it comes to formation of galaxies, star systems and planets. Sure there are some formation theories, but they fail miserably when trying to match real observed formation process. Another anti-science crank. Grow a pair, boy, and tell us what non-mainstream garbage you think can explain such things. A stellar binary connected and laced by electric currents. Certainly not a prediction of the standard guesswork. Liar. No electric current woo. Stop making things up.